I caught this shot (is caught even the right word?) 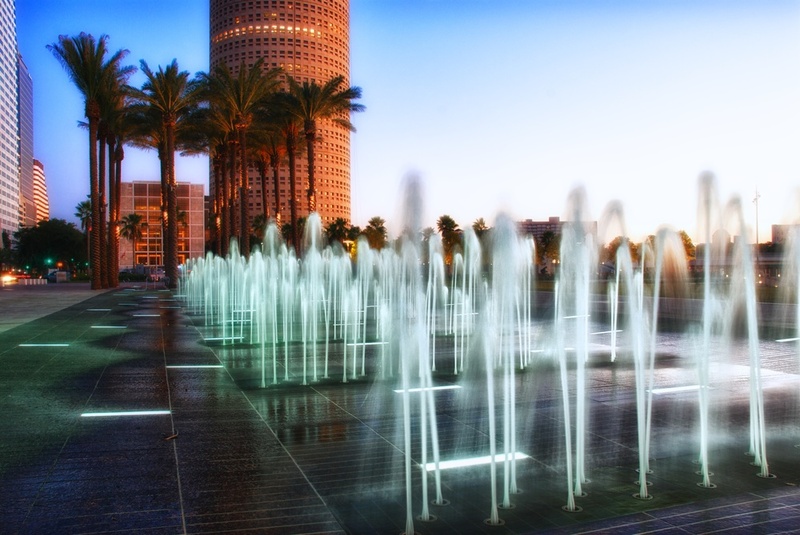 in downtown Tampa a while back on my quick trip through there. Sunset was approaching and I wanted to be somewhere downtown. I was hoping for a reflection of the skyline in the water, but I could never find a good spot for it, and I guess I ain’t smart enough to use Google Earth before I arrive to figure these things out. It’s funny - or sad, really - that I used to travel to Tampa at least twice a month, but this was years before I got into photography, so despite being familiar with the town, I wasn’t “photography-familiar” with it. I really had no idea where to go and shoot. How many wasted opportunities I wonder? Oh well, live in the present and all that. I am making up for it now though! Anyways, I found this open park area with these fountains, and with the light quickly departing I set up and rolled off lots of different shots.